In the Caterpillars the children have been exploring tissue paper. 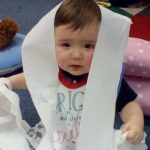 The children used a variety of skills from fine-motor when shredding the paper to gross-motor skills when hiding under the paper. The babies had a great time exploring together!